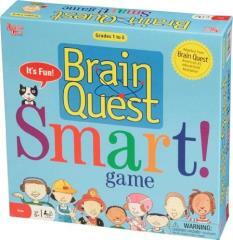 The newest edition of Brain Quest invites players to answer questions at their grade level. Each card has 6 questions from grades 1-6. The winner is the first to collect a chip in Science Math Art Reading and The World. Game encourages kids of different ages to compete on equal grounds Incredible 19 year history and strong brand recognition We constantly seek to keep our products contemporary through new product development and building on the licenses we carry to keep them new and exciting. University Games philosophy has always been to offer games that encourage social interaction and imagination through gameplay.